Fine art, indeed, this limited edition original painting is available for auction coming soon. Using this site: http://fatcatart.ru/category/klassy-ka/ as a platform for ideas, and using Photoshop (or something like it) as your tool, place a fat cat into a photo of a classic art piece. The goal is to make it convincing: make the art become on with the cat. Most of all, enjoy! 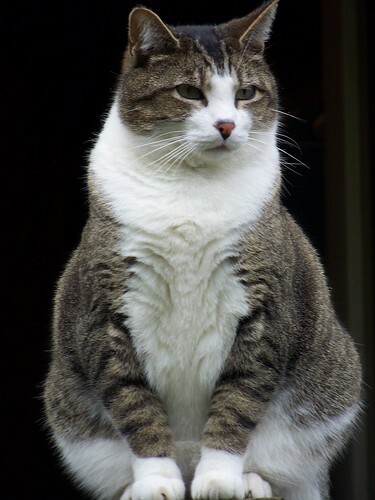 :0) And remember, fat cats make art better. 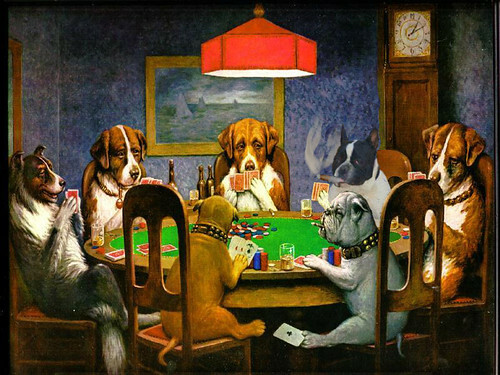 I use “classic art” in its most literal sense, for what gallery is not complete without a large painting of Dogs PLaying Poker? In Photoshop, I positioned the cat in a layer above the base scene. I aplied the paint daubs filter to make it look a bit more textured. Then, I use the selection tool to grab the outline of the chair and table as areas, I flip back to the cat and use to delete so it appears behind key objects. Finally I added (rotated too) a few copies of this playing card to fill out the feline’s royal straight flush. I am next thinking of a whole series of feline Velvet Elvises…. This is putting me on the floor with laughter! 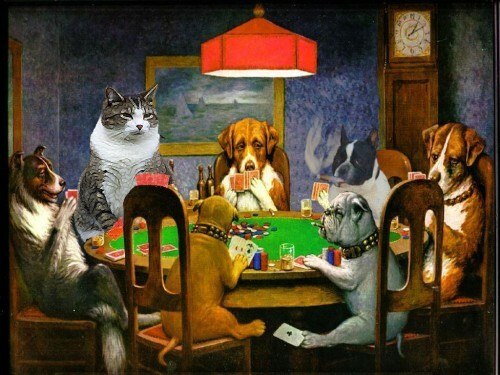 I was raised with this original dog playing poker image on some relative’s wall, so I know it well. The cat just makes me laugh! I appreciate your effort at some PhotoShop instructions, but I would love someone to do a screencast tutorial of the moves. I have never had a PhotoShop class, and while I vaguely understand the concept of “layers,” I don’t actually know how to do those moves you describe. I need something lower on the food chain. Sorry you are asking the wrong dog.